Even with the massive Navitimer 8 unveil barely behind us, we were kind of wondering whether Breitling would still deliver a healthy dose of novelties at Baselworld in 2018. And luck would have it, Georges Kern still had a few tricks up his sleeve that speaks to his new vision of the brand, and by and large, things are looking good for the future of the brand. Though one of the brand’s much larger release (both in media attention and in sheer physical size), the Navitimer Super 8, was unavailable during our press appointment, we still had a few gems to see and feel for the first time this year. The name of the game is clear at Breitling for the first time in a while—heritage is king, and the days of mega-sized watches is slowly fading into the background. Given the dwindling demand for larger 46mm+ timepieces, and the fact that the vintage market is still booming, the move is entirely logical. 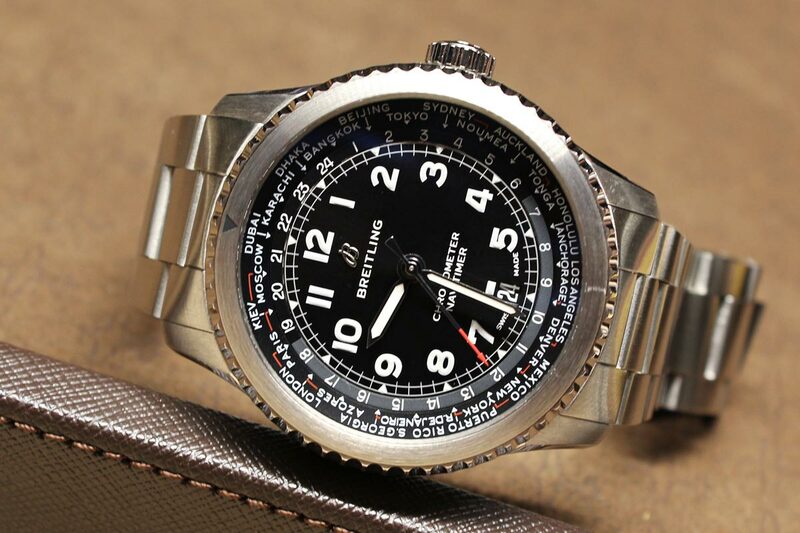 Thankfully Breitling’s heritage runs deeper than most, providing the much-needed legitimacy that is sorely lacking from many other brands who presently offer “vintage inspired” timepieces. The Breitling Navitimer 1 Automatic 38 is a watch that is COSC-Certified and hoolds a stunning dial. Case and point to the vision noted above, the Breitling has rolled out a very compact version of the classic Navitimer for 2018 in the form of the Navitimer 1 Automatic 38. While technically presented as a ladies’ piece, the model is already garnering attention from collectors from both sexes with a penchant for vintage timepieces. Available in stainless steel with either a black or blue dial, as well as the two-tone configuration seen here, this new automatic model is powered by a COSC-certified Breitling Caliber 17 (not one of their in-house calibers) with a modest power reserve of roughly 40 hours. Given that the Navitimer 1 is the true heritage line of the collection we would have liked to see the brand move to an in-house caliber with this model, but it’s highly likely that this will happen in the coming years. Given the rising popularity of two-tone watches these days—a style that was a huge part of Breitling’s collection in the ‘80s and ‘90s—this addition to the collection make sense, though we suspect that either the black or blue variants will be slightly more popular overall. 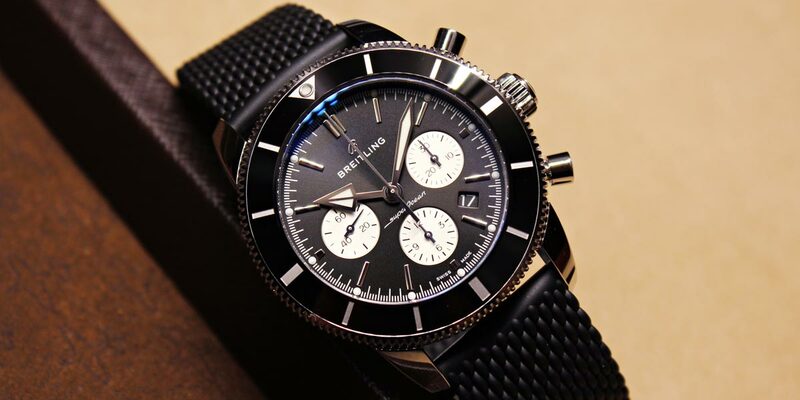 This Breitling chronograph is much more simple in appearance, but it is still an accurate timepiece. Breitling’s Superocean Heritage line got a proper refresh just recently, however, for 2018 the newest addition to the line is an important one; the addition of a B01 chronograph reference to the collection. Breitling’s pride and joy, the B01 self-winding in-house column wheel chronograph caliber has been fitted in a 44mm Superocean case, and the end result is just about perfect. The moderately large case still wears well on smaller wrists due to its short lugs, and being a dive watch any concerns about case thickness are pretty much a non-issue. Sticking with the design cue first unveiled with the Navitimer 8, every model fitted with this caliber features contrasting subdials. As it stands, the watch will be sold with a black dial with cream subdials, a blue dial with cream subdials, and a silver dial with black subdial (effectively a panda-dial configuration. If anything, the latter of the pack I would file as the least appealing of the pack, but we don’t doubt the brands certainly appreciate it. What are your thoughts on the Breitling Novelties this year at Baselworld 2018? Comment below. Though technically part of the Navitimer 8 launch in February, this is technically the first time the world timer version of the collection has been presented in the metal. To be frank, when first seeing the renderings I was far from convinced at how I would like this particular model, however seeing it in the flesh in this sunbrushed black dial with red accents, this is a perfect example of a situation where judgement should be reserved until the piece has been seen “in the metal”. This new release features the B35 in-house manufacture caliber from Breitling, which is COSC certified, and features a very healthy 70-hour power reserve. The 43mm case features a smooth brushed bidirectional rotating bezel, and an oversized crown that very much suits the piece’s overall utilitarian design. The white text indicating its cities are very legible against a black background, and it’s safe to say from a functional standpoint this particular dial color is the most legible of the pack by a landslide. By comparison, its silver dialed sibling, while still quite sharp from a visual standpoint, will require more care and attention when trying to read out the different time zones around the world. 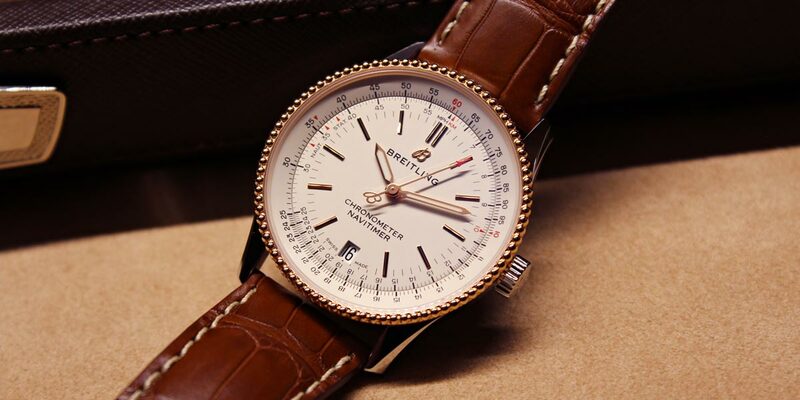 Priced at CHF7,900, the Breitling Navitimer 8 Unitime isn’t the most approachable world timer on the market, but considering its in-house caliber and other specifications the price is at least fair. Shown on a steel bracelet, this model can also be had on a black alligator strap with contrasting white stitching for CHF7,550.